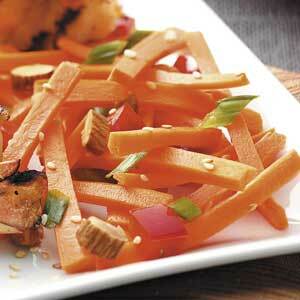 These carrots make a beautiful presentation and are absolutely delicious. In a small bowl, combine the sugar, vinegar and salt. Add carrots; toss to coat. Divide between two plates. Sprinkle with red pepper, onion, almonds and sesame seeds. Yield: 2 servings.